Point Park University's Center for Media Innovation opened its doors to students and the public for a gallery curated by Rob Rogers from the Pittsburgh Post-Gazette. Rogers, along with the Toonseum, gathered digital images, sketch processes, and original pieces from several local and national political cartoonists to display in the new media center through Nov. 18. 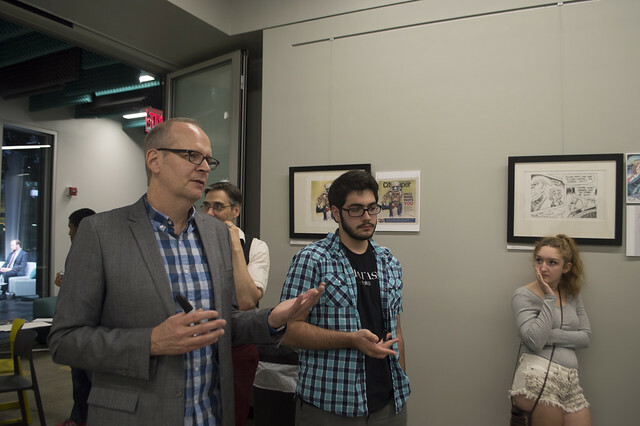 The gallery opening kicked off Oct. 20, where Rogers and local Pittsburgh-based artist and Assistant Professor Jonathan Trueblood were on hand for students, taking questions about caricatures and political cartoons. "This event provided an opportunity for students to show off drawings, learn to create caricatures and to consider current events while creating new work," said Zack Lamperski, a sophomore animation and visual effects major from Springdale High School. "It was a great success!" Trueblood and Rogers gave advice to students wanting to become political cartoonists or animators, as they drew their favorites from the election. "I received some insight as to how political cartoonists brainstorm their art and formulate ideas, along with some basic tips on exaggerating a person's features in a drawing," said Noah Ondik, a sophomore animation and visual effects major from Hopewell Senior High School. Additionally, students competed in a draw-off competition in which they had three minutes to sketch the best picture of either Donald Trump or Hillary Clinton. After time was called, Rogers judged the caricatures based on design and thought process.